Mechanical forces and their influence are found in many day-to-day life examples in Nature. In spite of this, the scientific advances on the effect of mechanical forces at the molecular level in understand of chemistry and biology have been limited. This is mainly due to the lack of experimental techniques to study these phenomena in a controlled manner. In biology, mechanical forces play a central role in ubiquitous phenomena such as protein degradation, cell-adhesion, tissue organization, and muscle function in multi-cellular organisms. The key players in these phenomena are protein molecules, which act as mechanosensors and communicate the surrounding dynamic microenvironment with the cell. Hence, studying the mechanical response of these biomolecules would provide a wealth of information about their structure, function, and chemistry. 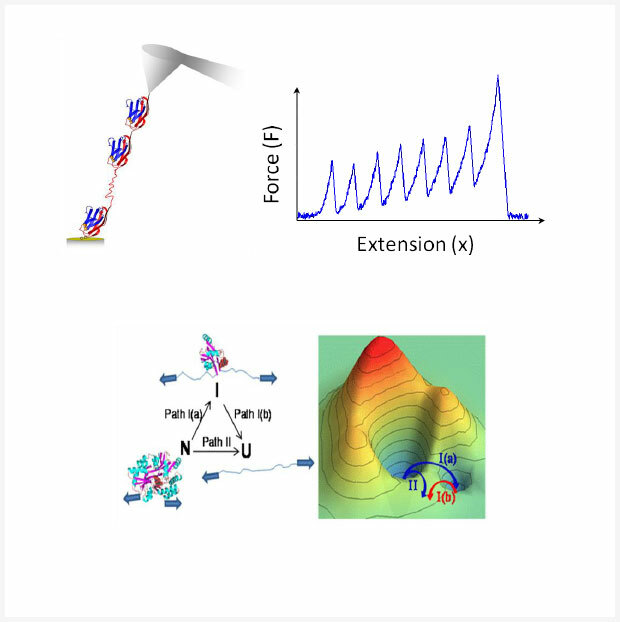 Experimental characterization of mechanical response of biomolecules has been accelerated with the adoption of optical-tweezers and atomic force microscope to study biological phenomena. These two methods have made a great deal of progress in understanding the protein mechanics, in the past two decades. In chemistry, the bond-making and bond-breaking are central phenomena and the reactivity of bonds and the differences can be understood only by the underlying mechanistic details. In recent years, ‘force spectroscopy’ has been adopted to get the structural details of transition states with an unprecedented sub-angstrom resolution for certain solution phase reactions. This is analogous to ‘femto-second chemistry’ of gas-phase reactions. In the Molecular Biophysics and Imaging group and the Chemical Physics and Dynamics group , we use state-of-the-art atomic force microscope (SM-AFM) to probe single molecules for studying mechano-biology and mechano-chemistry and bulk techniques, such as fluorescence spectroscopy, circular dichroism etc., for characterization. By using this novel SM-AFM technique, we can apply stretching force to a single protein molecule, measure its mechanical response and study protein mechanics. In addition, we compliment our protein mechanics experiments with steered-molecule dynamics (SMD) on proteins and peptides. We also use Monte Carlo simulations to extract free-energy surface parameters from protein mechanics experiments. More information about our methods and interesting problems we are currently investigating in our laboratory can be found here.